The SensorTag is a Bluetooth Low Energy development kit targeted at iOS developers. I’ve talked about the TI SensorTag before. It’s an interesting bit of hardware aimed squarely at simplifying smart phone developers’ lives when prototyping Bluetooth accessories. While we’re now starting to see similar and potentially more generally flexible boards arrive on the scene — like the MetaWear — the SensorTag was the first and is still a powerful bit of bit hardware, especially for the price. The SensorTag includes six different MEMS sensors — an IR temperature sensor, an accelerometer, a gyroscope, a humidity sensor, a pressure sensor, and a magnetometer. All of these sensors can be controlled individually from the the SensorTag app — or from your own code — via Bluetooth LE. But TI isn’t standing still. Today the company announced it is adding iBeacon support to the SensorTag, along with the ability to support iBeacon functionality on all other TI reference designs that make use of the same CC2541 chip that powers the SensorTag, as well as support for the newer CC2543 chip, which is a lower-cost version of CC2541 optimized for beacons and broadcast applications. 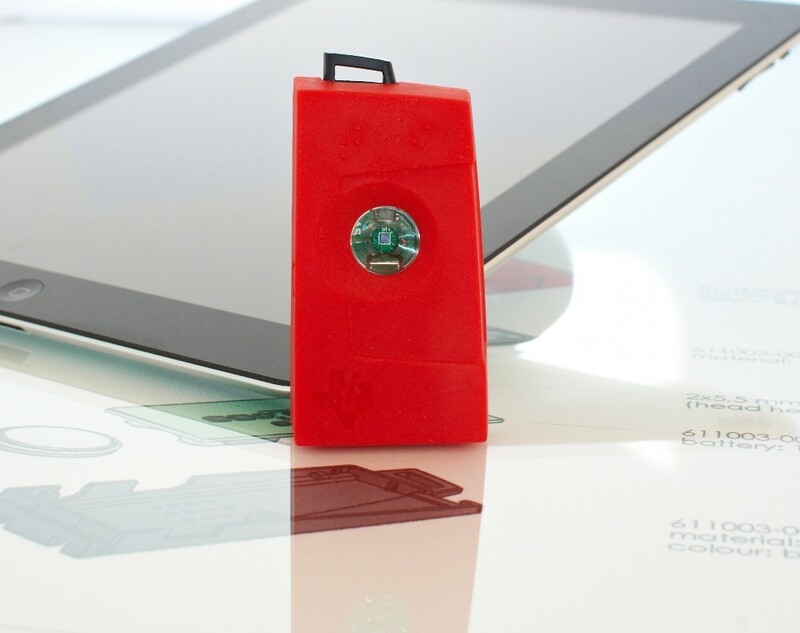 iBeacon is a technology that allows you to add real world context to smartphone applications. Based around Bluetooth LE, part of the new Bluetooth 4.0 standard, it’s a way to provide basic indoor navigation and iBeacon has been integrated into iOS 7 both inside the Core Location and the Passkit frameworks to enable indoor micro-location and geofencing. and together the create a unique beacon identifier which is associated with a location. However the iBeacon really isn’t really about location; it’s about proximity. Your iPhone — or now even your Android phone — can alert applications when you are approaching or leaving a location with an iBeacon. 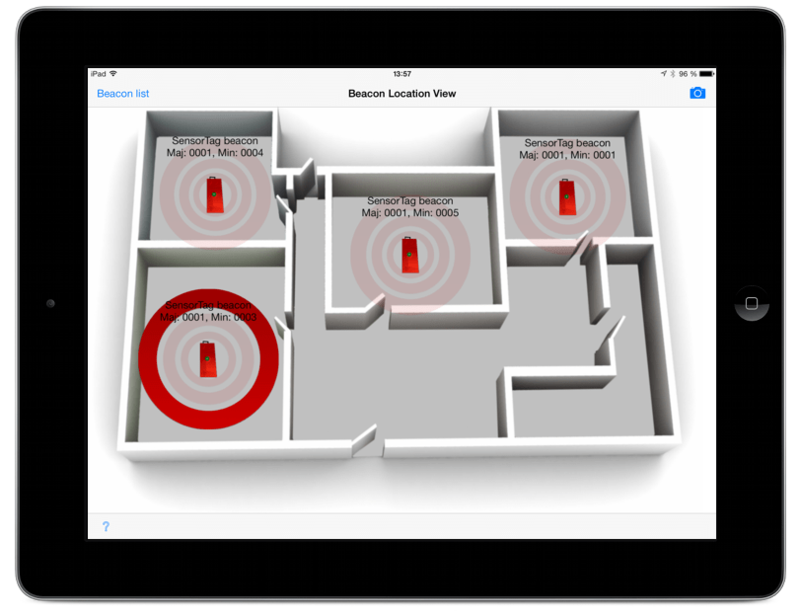 It can also report an estimate of your proximity to the iBeacon, but you should be aware that the closer you are to the beacon, the more accurate the estimate of proximity becomes. The two factors here are signal strength and radio interference. While signal strength is fairly dependable, interference is not — and can change radically with time. So while you can generally depend on the beacon to alert your app that you’re in its general proximity, I’d be wary of relying on the ranging to much. After today’s update you can still use your SensorTag as normal, but you can also configure it as an iBeacon using an updated SensorTag app, and then place it into iBeacon mode using one of the buttons on the tag. Using the default 100ms polling time, the SensorTag’s battery will last a few months in beacon mode. However, if your application can work with a slower polling time — also configurable from the SensorTag app — then battery life becomes much less of an issue and can (at least in theory) extend out to a year. There is some basic security in place. To configure the UUID, Major, and Minor characteristics of the beacon you’ll need a PIN code. This is pretty much the minimum needed for a over-the-air configurable iBeacon, something that was obvious when we looked at the Estimote beacons earlier this year, although even doing this doesn’t mean that iBeacons are a good fit for all applications as it’s easy to fake iBeacon signals — the UUID, Major, and Minor characteristics, the things that uniquely identify a beacon, are publicly broadcast. The new SensorTag location app running on the iPad showing your location. Along with the new firmware comes a new location app for the iPhone and iPad. The app allows you to upload an arbitrary floor place and “place” SensorTags around the virtual space — effectively allowing you to create your own indoor positioning system — and with hooks to call a specified URL when you come into proximity of a SensorTag. A new SensorTag location app with iBeacon technology is available to download on the App Store for iPhone, iPad, and iPod touch. The app allows you to upload a floor plan and “place” SensorTags to easily set up your own indoor positioning system. The app provides feedback on how near you are to the SensorTags and can launch a user-specified URL when you are in the immediate vicinity of a SensorTag. I talked to the inventor of the SensorTag, Jarle Boe, ahead of today’s public announcement and it was interesting to hear that Boe and TI don’t see iBeacon technology being restricted to retail environments. The new SensorTags are available now via the TI store for $25, or if you already own a SensorTag you can do an over-the-air upgrade of its firmware to support iBeacon functionality using the newly updated SensorTag app.